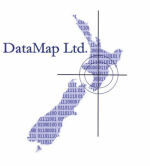 Display of historic data | DataMap Ltd. Historic records have been migrated from an Excel worksheet into a Geographic Information system. Geographic Information Systems display the spatial location, and can be used to sort, find and analyse relationships between objects. This is very useful if you want to know the historic distribution of Kiwi in Taranaki. Kiwi records in Taranaki. This is an interactive map, so use your mouse to control it and zoom in or out, see the legend, or open the layer with historic records of kiwi (and when they were last seen in New Plymouth; Welbourne in 1978). Click here for help with using the map tools and layers.